UPCA will hold its 2011 Annual Meeting at 3:30 PM on Friday, May 13, in the Ruby Room on the Second Floor at the Pheasant run Resort. It is important that all Member Clubs be represented at the meeting. All other interested pipe smokers are invited and will be most welcome. No advance registration is required so feel free to show up and participate. 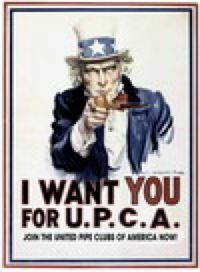 Please bring your ideas as to how UPCA might provide mre benefit to its Member Clubs and the American pipe smoking community. CLICK HERE for details. We look forward to seeing you there.